The failure of the California Republican Party‘s gas tax repeal initiative on Nov. 6 has been greeted with a steady downward trend in gasoline prices. The average price of a gallon of regular in the San Diego area has dropped 21.5 cents over the past 30 days — almost double the 12-cent per gallon tax increase. The juxtaposition of these two events is ironic, but probably not surprising to most California voters. Anyone who has driven a car over the past decade is painfully aware that events far beyond the Golden State determine the cost of gasoline — and also painfully aware of the poor condition of California’s highways. Most voters understood that a small tax increase to fix roads would be dwarfed by swings in the global price of oil. And after 10 months of visible work on road projects, with Senate Bill 1 signs on seemingly every highway, there was tangible progress. The irony is that Proposition 6 proponents made the assumption that voters could be easily fooled, or at least confused. They railed about the impact of the gas tax increase on working families. They accused Caltrans of being inefficient, citing the lower cost of road building in rural states as proof. In the days before the election, DeMaio proposed a recall of California Atty. Gen. Xavier Becerra over the wording, claiming voters were “defrauded of their intent to vote ‘yes’ on Prop 6.” But Becerra went on to win re-election by a margin of 63 percent to 37 percent for his Republican challenger. With that kind of blowout victory, and gas prices falling, it’s hard to see how a recall could gain traction. But then it’s also hard to argue that voters didn’t understand what they were voting for. There was always a Machiavellian angle to the proposition. Republican leaders saw it as a read meat issue that would increase turnout and possibly save a few House seats. A photo from the earlier this year shows gubernatorial candidate John Cox and Congressional candidate Diane Harkey standing with Carl DeMaio amid boxes of ballot petition signatures. 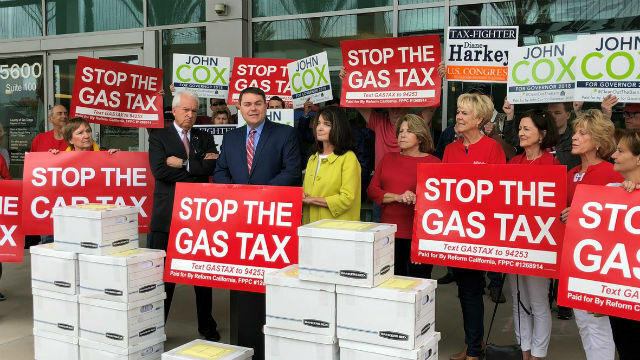 Cox and Harkey both lost in the Democratic wave election that turned even Orange County blue. Nobody likes paying taxes. But California voters were smart enough to know that a small tax increase for road repairs wouldn’t make much of a difference in the price of gasoline–and could make their commute safer. Chris Jennewein is editor and publisher of Times of San Diego.